I have been in the hoof care business for more than 16 years and have seen my herds expand in size over and over again. 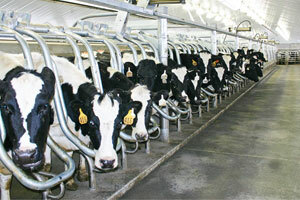 The industry has integrated from mid-size herds in tiestalls and cows spending much of their time on pasture to larger freestall operations with cows spending most or all of their time walking on concrete. The term “hoof rot” is a phrase that might be used on your farm to describe a sore foot. Before I explain the disorder itself, I would like to share the definition I found on Google. To be clear on this subject, I prefer to use “foot rot” in this article, referring to the scientific name, interdigital necrobacillosis. However, we must be careful not to use this name to describe all lameness or different clinical pictures. Leptospirosis is a disease that can impact the bottom line of every dairy producer, mainly through lost reproductive efficiency. Leptospirosis is a zoonotic bacterial disease that affects mammals worldwide. The definition of a zoonosis is a disease that can be transmitted from animals to people. Leptospires are gram-negative bacteria that can survive for considerable periods of time in moist soil or standing water. Warm, moist conditions are ideal for the spread of leptospirosis. When talking about employer/employee relations, the topic of interaction frequently comes up. These discussions are usually centered on people; they don’t normally consider the most valuable employees on the farm – the cows. What is communicated to them by way of your actions or those of your human employees? Known as one of the largest health problems on United States dairies, lameness costs producers thousands of dollars each year through veterinary bills, higher culling rates, lost milk production and a decline in reproductive performance. 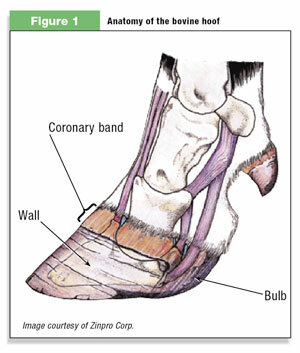 While lameness is not often tied directly to reproductive failure, research continues to show that sore feet are closely tied to breeding pen performance. It’s nearly impossible to understand why the dairy cow’s hoof responds to stress in the ways it does without understanding its structure, which is illustrated in Figure 1. If you’re in the dairy business, you’ve no doubt seen the grim results of an acute case of coliform mastitis. The fever; hot, painful udder swelling; grossly abnormal milk; lack of appetite; and shock-like symptoms are difficult to watch and even harder to forget. Often, severe cases like this lead to loss of a quarter, at best; and loss of the animal, at worst. We tend to think of these sporadic cases as the only instances in which we deal with coliform mastitis. But, in fact, about half of all clinical cases are caused by noncontagious environmental organisms, including E. coli, Klebsiella and Enterobacter, which fall together under the umbrella of coliform or gram-negative mastitis.